Brandon Lloyd was the subject of the second football-related article I ever wrote. This was two years before I launched the Rookie Scouting Portfolio. Lloyd was a fourth-round pick in his second year with the 49ers and he was beginning to make plays like the ones above. I have always believed Lloyd was a special player with a high football IQ, flypaper hands and a skill for adjusting his body to the ball that makes one wonder if there really is a Matrix. Only Larry Fitzgerald rivals Lloyd when it comes to this aspect of playing the receiver position at the highest level. Recently, I came across two college prospects that flash certain skills where they look almost identical to a current NFL star. One of them is Tennessee Chattanooga Mocs QB B.J. Coleman. If you watch his drops, play fakes, ball carriage, pump fakes, and release, you could stick a blue and white No.18 Colts jersey on him and you wouldn’t know the difference. Coleman voraciously studied Peyton Manning’s game as a redshirt freshman at Tennessee before transferring to Chattanooga. He was a junior college transfer. His coaches at ECU said from the moment Lewis arrived on campus that he had pro potential if he worked at his game. Some of the plays he makes are the spitting image of plays we see from Brandon Lloyd on Sunday. I’ve watched Lewis against Maryland, Tulsa, and South Carolina. Against the Gamecocks the ECU wide receiver gave All-SEC cornerback Stephon Gilmore a real challenge – beating him repeatedly on fade routes, including a Brandon Lloyd/Randy Moss-like, red zone catch for a score. My colleague Josh Norris has Gilmore as his No.3 cornerback in this draft class. Lewis is barely in the realm of conversation among wide receivers – and that’s only if you count me and Ryan Lownes talking to each other about him on Twitter. If evaluating Lewis solely on physical ability, football skill, and potential, he’s at least a fourth-round prospect. When it comes to the fade route, he might be among best. Here are two plays where Lewis is Brandon Lloyd’s doppelganger. 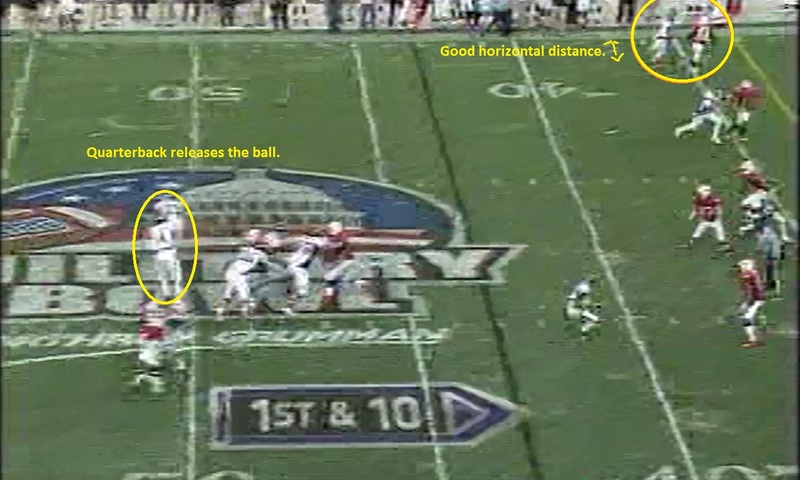 The first target is a 1st and 10 with 9:01 in the half from a 2×1 receiver, 10 personnel shotgun set. He is the outside receiver on the far side trips of the formation. He has drawn single coverage and the corner is giving Lewis an seven-yard cushion. As Steelers RB Chad Spann says to me, "the safeties never lie." This single high safety is saying, "single coverage for Lance Lewis." Lewis runs a 22-yard back-shoulder fade. The ECU receiver isn’t a burner, but he’s fast enough. Most important is that he has control over his speed.The Maryland corner cuts this cushion to four yards before the snap and as the play begins Lewis takes an outside release. Lewis is nearly even with the corner eight yards down field as the QB releases the ball. 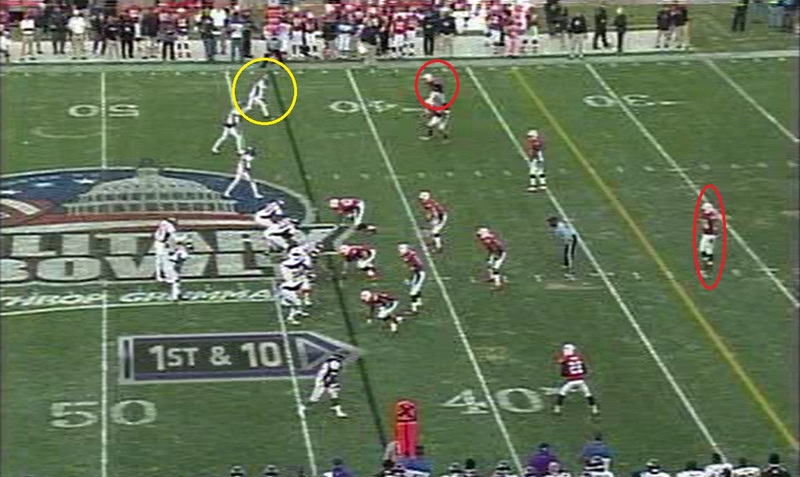 Note that the ECU WR is not hugging the sideline. 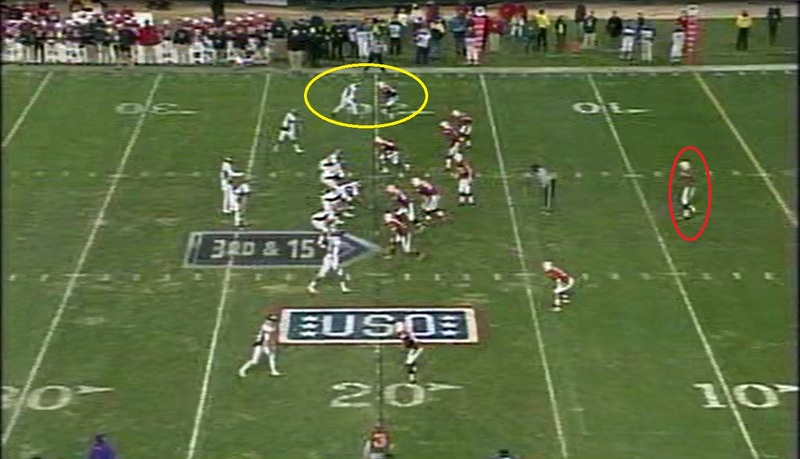 A sideline fade route is called a “fade,” because the receiver is suppose to fade towards the boundary. This means he has to leave room to veer outside until the final stage of the route. Achieving separation is not just a vertical concept. Understanding how to give a quarterback an open area to throw the ball is an underrated skill. On this play, the ball is already in the air so getting that kind of distance is not as important as if this sideline fade were a 40-yard throw. 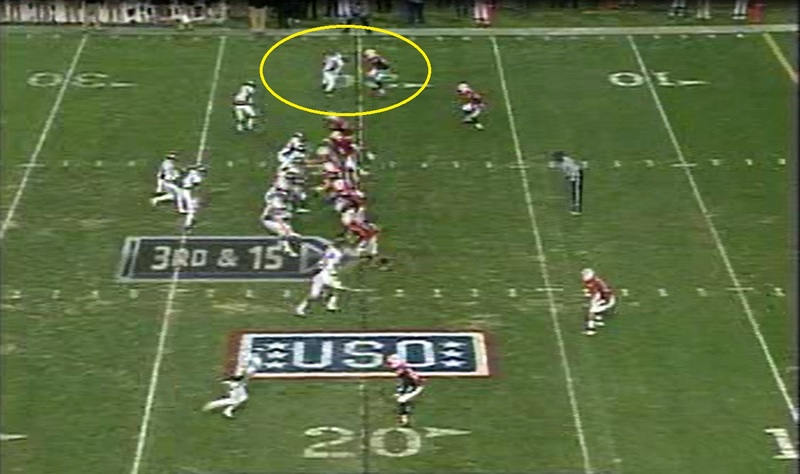 However, it’s still good for the wide receiver to get that separation so he has room to work the corner. That’s easier said than done, because defensive backs are taught to use the sideline as their friend and pin them there., limiting the receiver’s options to maneuver for the ball. Lewis is now even with the corner with his good for him. However he's less than a yard from the sideline. The corner effectively as Lewis "pinned" to the boundary. Not so good. But Lewis has control over his speed. Moreover, he has excellent control of his body. As the ball arrives, Lewis stops, executes a tight spin a foot from the boundary, and makes a leaning catch over the sideline. Lewis accelerates a step ahead of the CB but then sinks his hips to break suddenly so he can turn back to the ball. The position of the corner illustrates why a hard break can be a receiver's best friend. 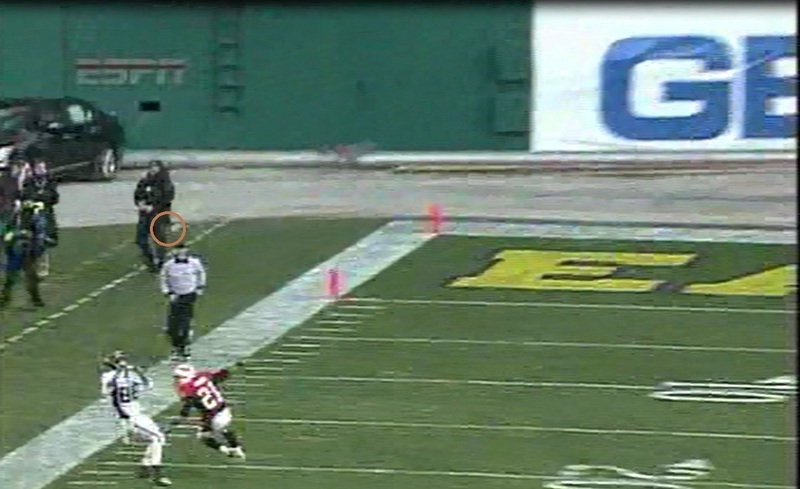 As Lewis extends his arms to the ball, arching his back to the sideline, notice his feet have not moved in the past two frames of this sequence. That's an indication of sideline awareness. Lewis catches the front end of the ball, he's leaning at closer to a 45-degree angle and his feet have barely moved. The corner? He's still recovering from the hard break. 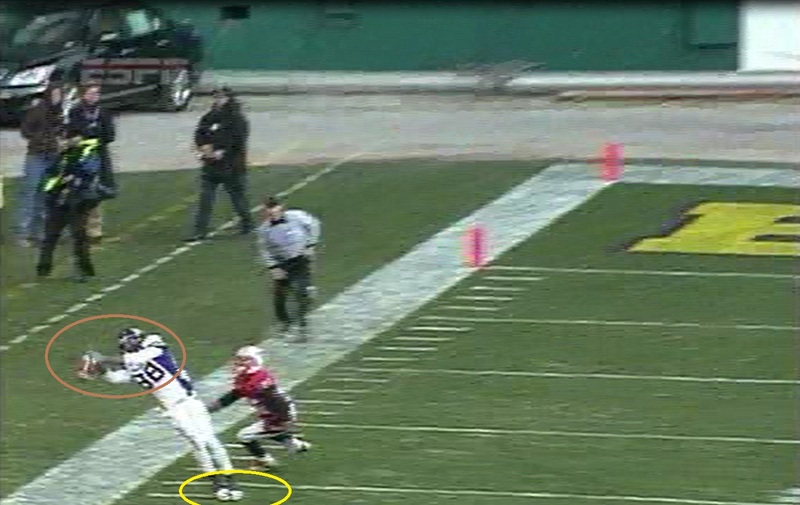 Lewis had control of the ball with two feet down. Now he just needs to maintain control as he hits the ground for it to count as a catch. It appears that he caught the ball, but the officials rule he doesn’t maintain possession as he falls out of bounds. 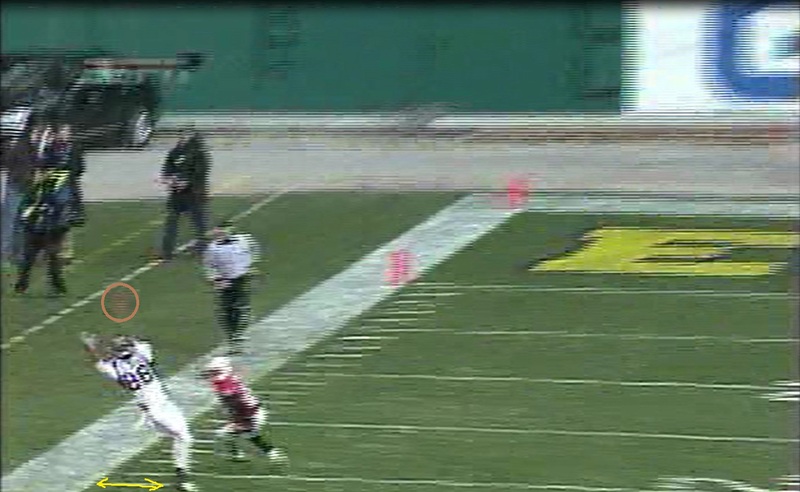 Unless the ball moves, Lewis controls this catch. However, the officials said no. I thought it was a perfect catch and looked like the plays I’ve seen Brandon Lloyd made for years. It was beautiful catch of the front end of an under thrown football. However because he caught the ball at such a precarious end as he fell on top of it the reception was ruled a trap. Very tricky. I’m counting it as a difficult catch with great body control and sideline awareness for 22 yards. I don’t know about you, but I’d rather have five non-catches that reveal what the player can do than five catches that don’t show much of anything. Fortunately, if a scout doesn’t feature this play in the cut-ups then this next catch for a touchdown will be there. Lewis scores on a 3rd and 15 pass with 9:58 in the third quarter from a 2×2 receiver, 10-personnel shotgun set. He’s the outside receiver on the far side of the field with the CB in press. Single safety, press coverage, it's time for a fade route to Lewis. Lewis's jab step and reduction of his inside shoulder is quick, fluid, and earns him a great outside release from press coverage. The ECU Pirate’s fake is so good, the CB stumbles and Lewis is three steps on top of his opponent by the time he’s 10 yards of the line of scrimmage. 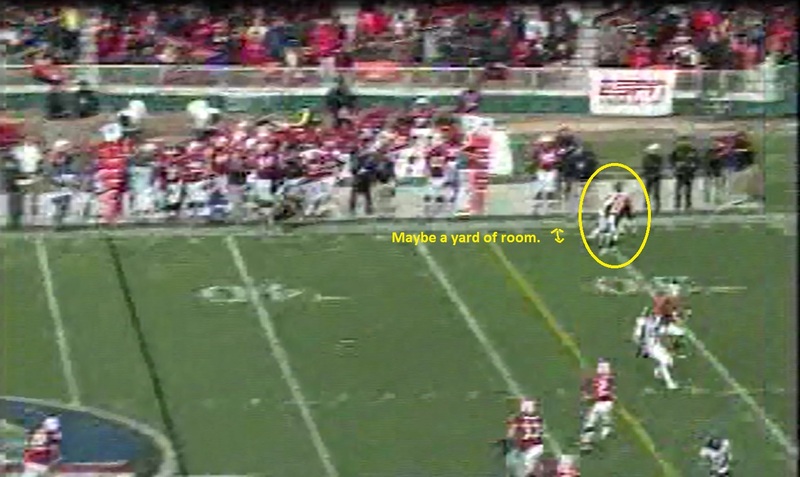 Okay, maybe it only takes eight yards for Lewis to win this route handily. Lewis tracks the ball over his inside shoulder and fads towards the sideline, making the catch literally inches from the front side of the pylon. Despite taking an outside release, he has more than enough room to still fade towards the sideline. Lewis' vertical separation only serves him so much on a shorter route. Having room to maneuver horizontally makes this route. Lewis makes it a habit to extend his arms well before he's close to the sideline. 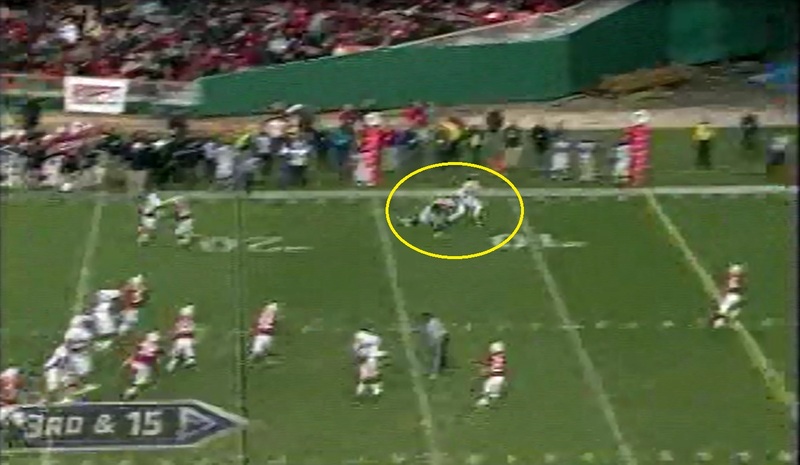 If the corner were closer, Lewis' arm extension with his back to the defender would serve as en effective shield. When Lewis makes the catch, you begin to seek why the receiver makes the decision to extend for the ball with his feet well inside the yard marks of the boundary. 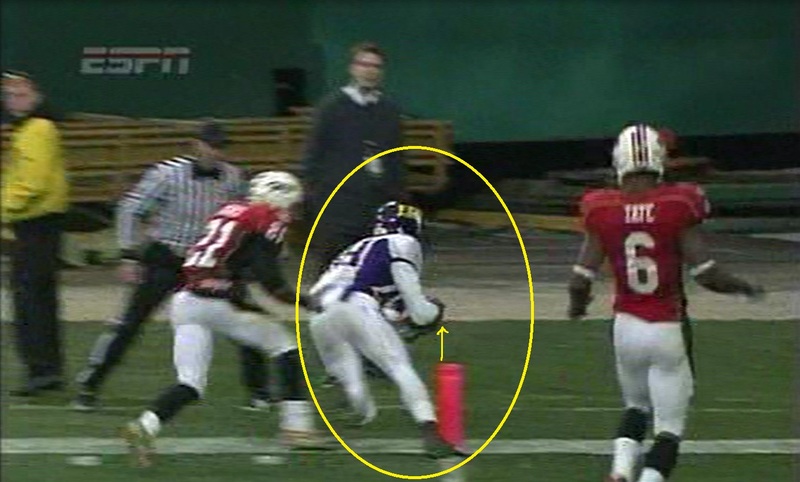 The ECU receiver’s arms are angled to the left of his body just enough to catch the ball, but Lewis’ hips and knees are pointed just inside the pylon. There has to be some real thought behind fade routes for Lewis' timing and positioning of his body to be so good. Lewis slides the front foot towards the pylon while anchoring that back foot in place as he secures the ball. Lewis' front foot makes contact with the pylon, the back foot is still anchored, and he extends the ball towards the goal line. As long as the ball crosses the pylon the ball can be outside the boundary and the touchdown still counts. The list of attributes Lewis shows on this one play is long: Great release, good route break, strong ball-tracking skill, good hands, great sideline awareness, and insane body control. 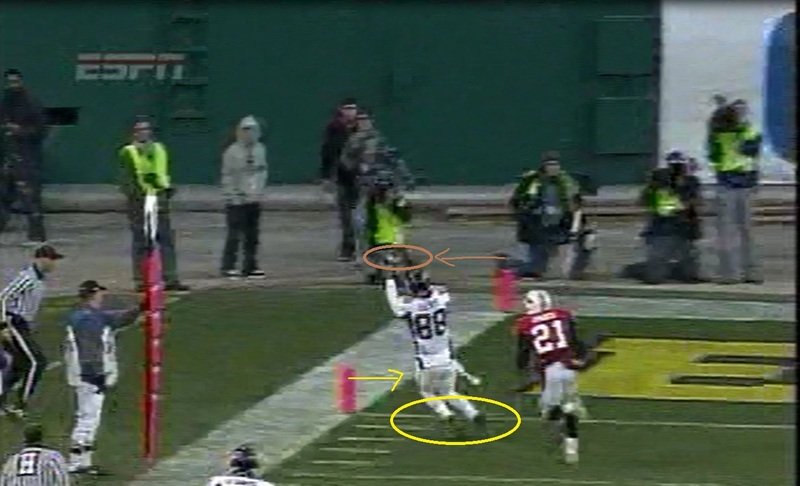 Not that others can’t do it, but these plays are signature Brandon Lloyd catches. Great information and heads up on Lewis. I have used your RSP the last 3 years to find hidden gems like Lance Lewis in my rookie dynasty draft – I’m looking forward to your 2012 issue. Thanks Mike, looking forward to finishing it! my favorite pic by pics are with WRs – too often we only see their highlights of QB taking snap and then at best… an adjustment on the ball… RBs are a bit more obvious. Cuts and how poor the defenders angles were in the first place. Cameras rarely follow the WR as he beats corners at the line etc etc. My pleasure. I’m fascinated by the game within a game of a WR and DB on the island. The more I watch, the more interesting this game becomes. Love the Brandon Lloyd comparison. I’d been thinking of him as a smaller Cris Carter, but this makes more sense. Sometimes player comparisons are hard to make because there’s such a blend of different skill set influences. 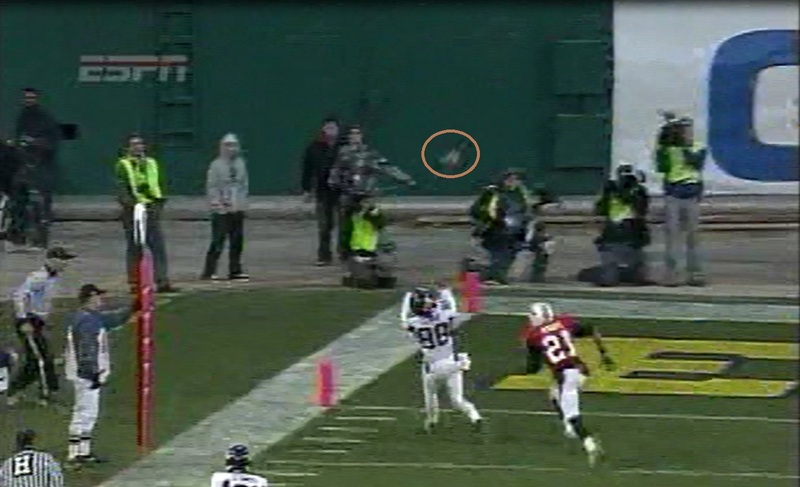 In this particular area, Lloyd sticks out but I’m sure Lloyd watched plenty of Cris Carter, too. That’s probably his influence.